All of them are related to information that Robobo can capture through the sensors located in the base. It is important to use the monitoring window to check the values returned by these sensors in real time in each specific environment. 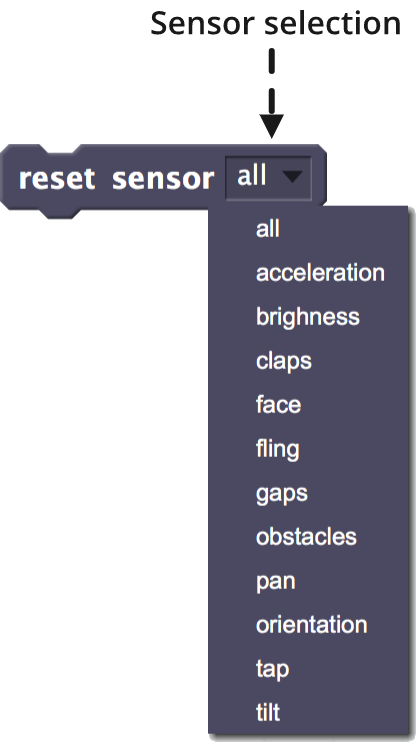 Function: restarts the sensor selected in the drop-down field. This block affects the smartphone sensors too, so it will be described in that section again. 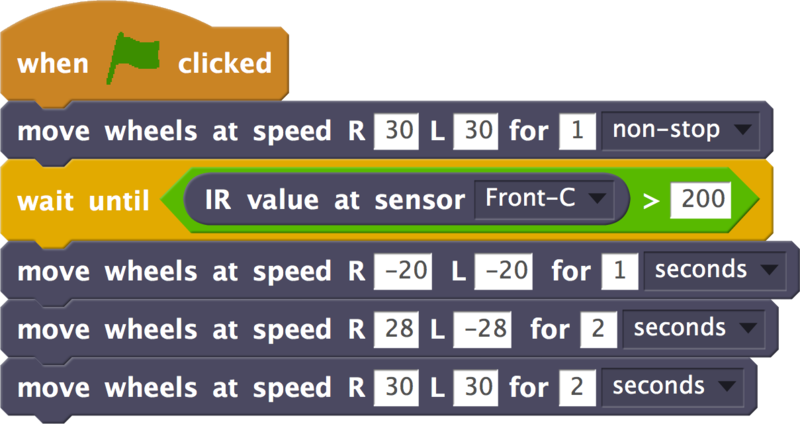 IR: resets the value of the infrared sensors to 0.
acceleration: resets the value of the accelerometer to 0 in the three axes (x, y, z). 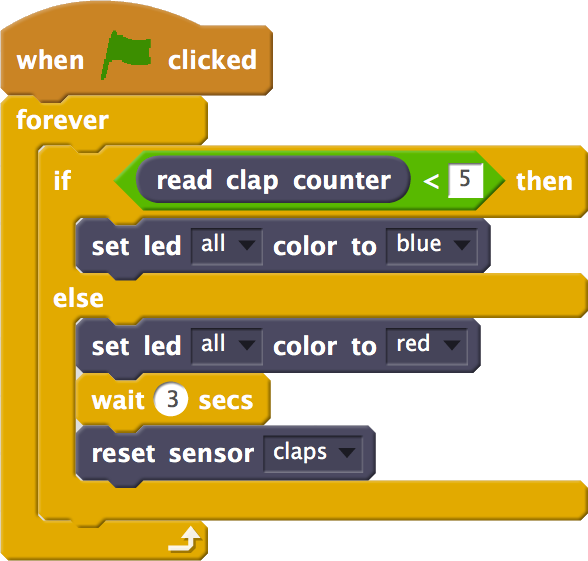 brightness: resets the ambient light sensor value to 0.
claps: resets the clap counter to 0.
face: resets the distance to face sensor to 0 and the position sensor (x, y) to (0,0). 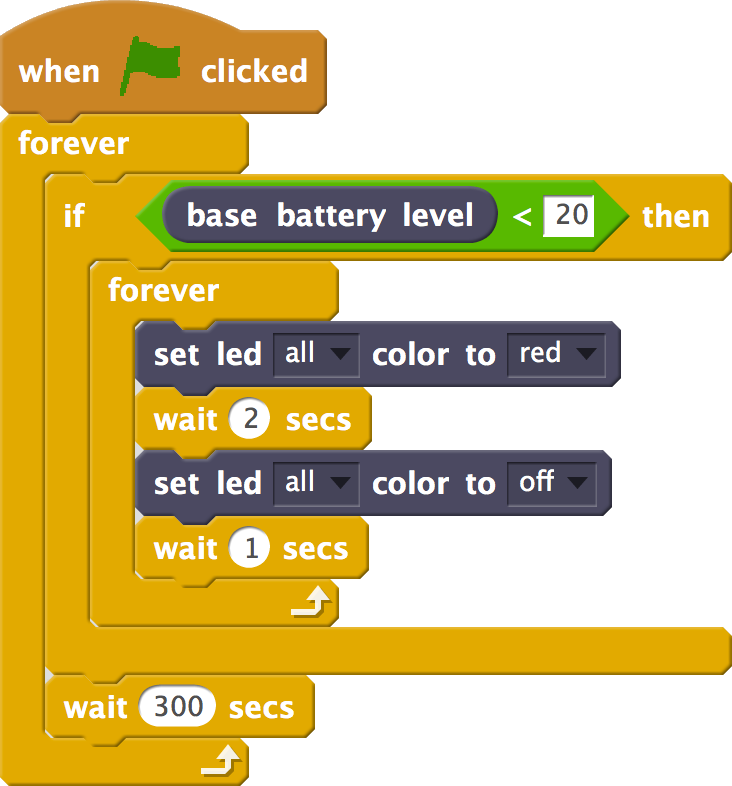 fling: resets the fling angle sensor to 0.
orientation: resets the orientation angles of the smartphone (yaw, pitch, roll) to 0.
tap: resets the contact zone sensor on the screen to NONE. Function: returns the value measured by the infrared sensor (IR) selected in the drop-down field. RangE: from 0 to inf (without limit). The larger the value, the smaller the distance at which the detected object is located. Therefore, this value is a kind of intensity of reflected energy, so if it is 0 it means that no object is detected. WARNING: The operation of the infrared sensors depends on the ambient light level and the material of the object to be detected. 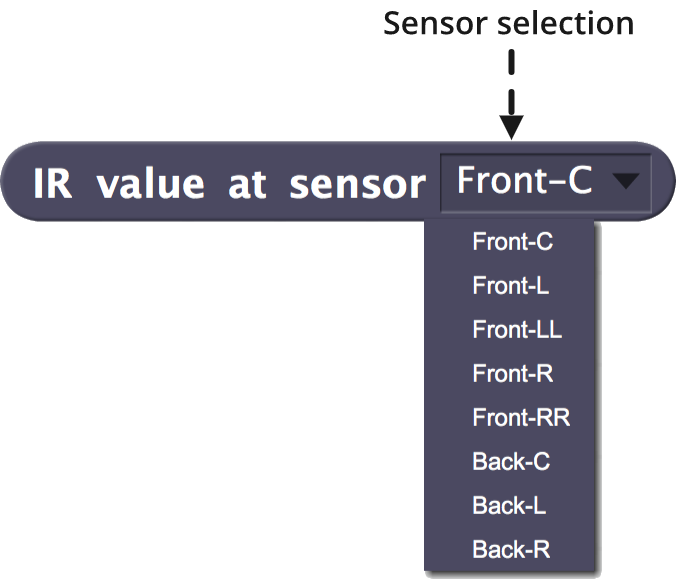 As a consequence, the value returned by this sensor must be calibrated in each particular environment. 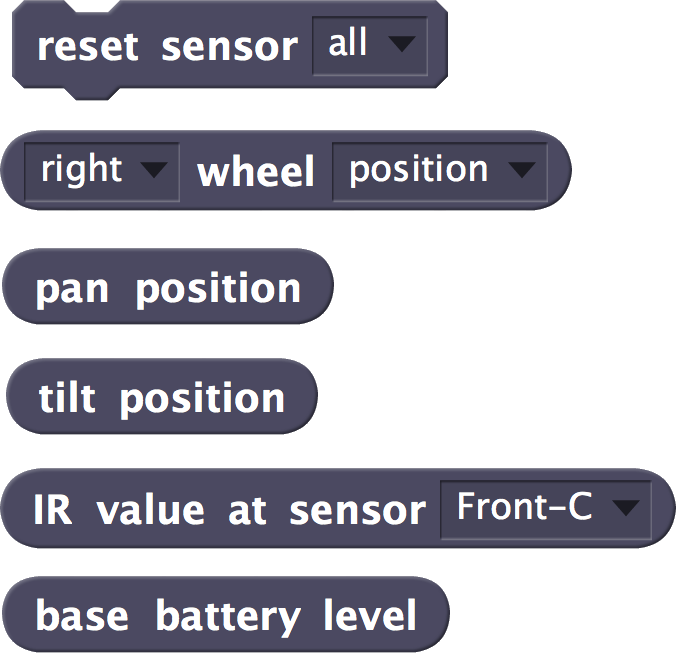 There are 8 infrared sensors in the Robobo base named as shown in the previous image. The Front-C, Front-LL, Front-RR and Back-C sensors are oriented parallel to the ground, that is, they detect the objects in front of them, but they do not detect possible holes in the ground. On the other hand, Front-L, Front-R, Back-L and Back-R sensors have an orientation of 45º with respect to the ground in order to detect these holes, and thus avoid falls from height, for example. 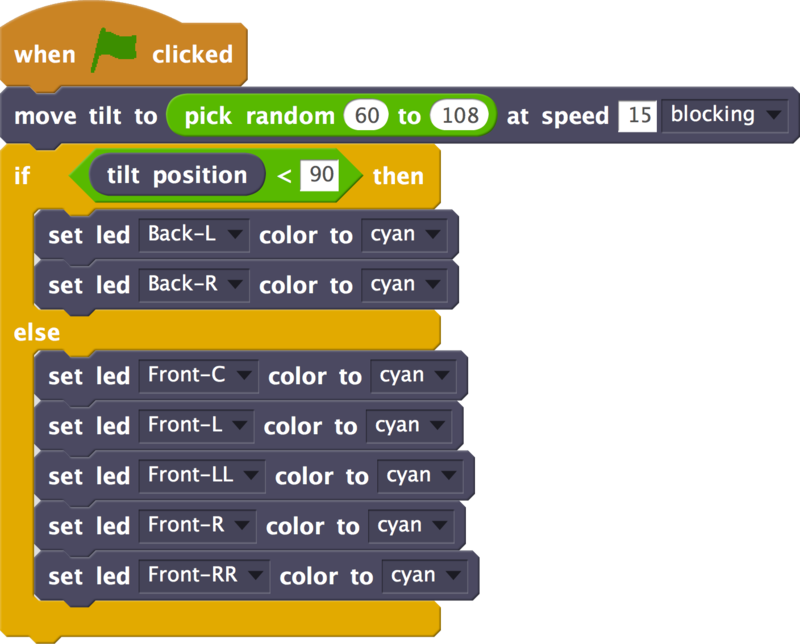 This orientation influences the use of a sensor or another to detect obstacles. 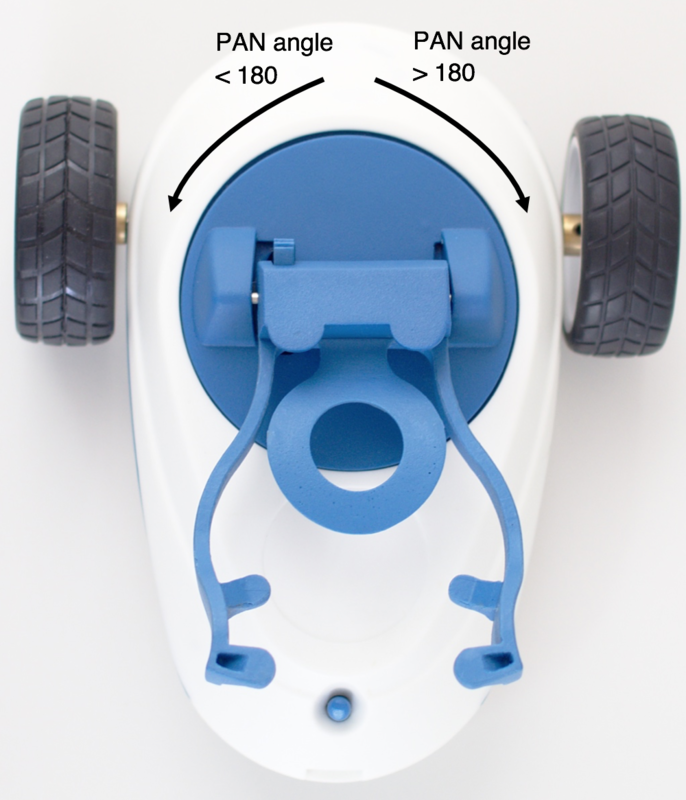 Function: returns the battery level of Robobo base. RangE: from 0 to 100, so that the higher the value, the higher the base battery level. 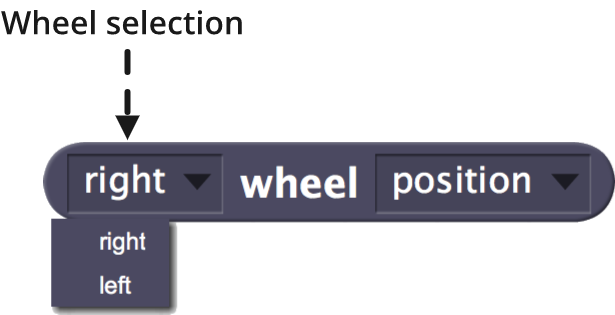 FuncTION: returns the position of the motor selected in the drop-down field. This position corresponds to the degrees of rotation of the wheel from its restart. RangE: from -inf to inf (no limit). It must be taken into account that a full turn of the wheel is 360 degrees. If the wheel rotates backward, the degrees of rotation decrease, and may be negative. Function: returns the PAN motor position. It corresponds to the degrees of rotation of the motor since its restart. RANGE: from 27 to 339, according to the allowed angles for this engine, being 180 the start value (as shown in the image). Values less than 180 indicate that the PAN is turned to the left, while values greater than 180 indicate that it is to the right. 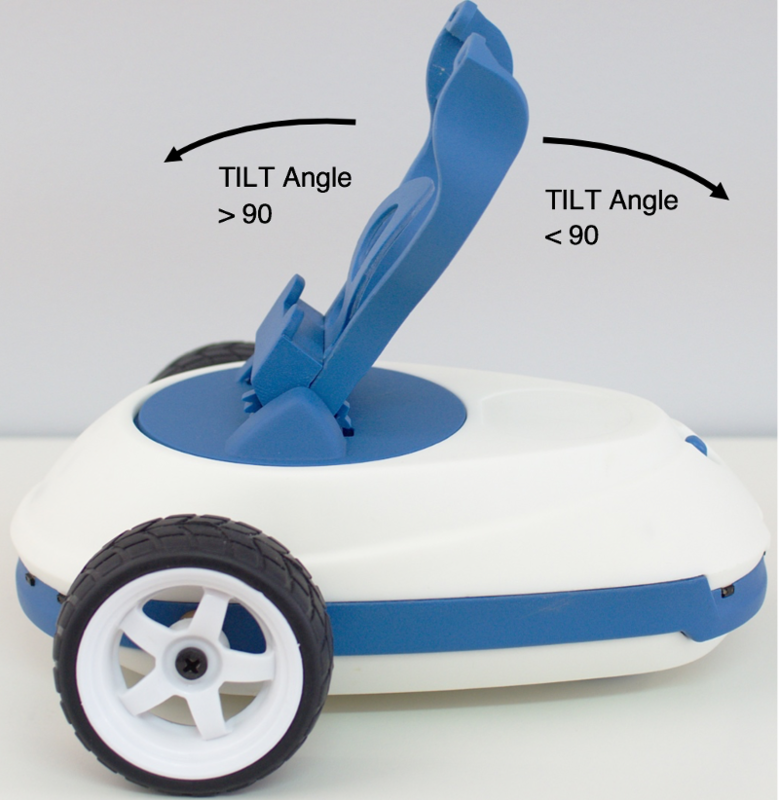 Function: returns the position of the TILT motor. This position corresponds to the degrees of rotation of the motor since its restart. 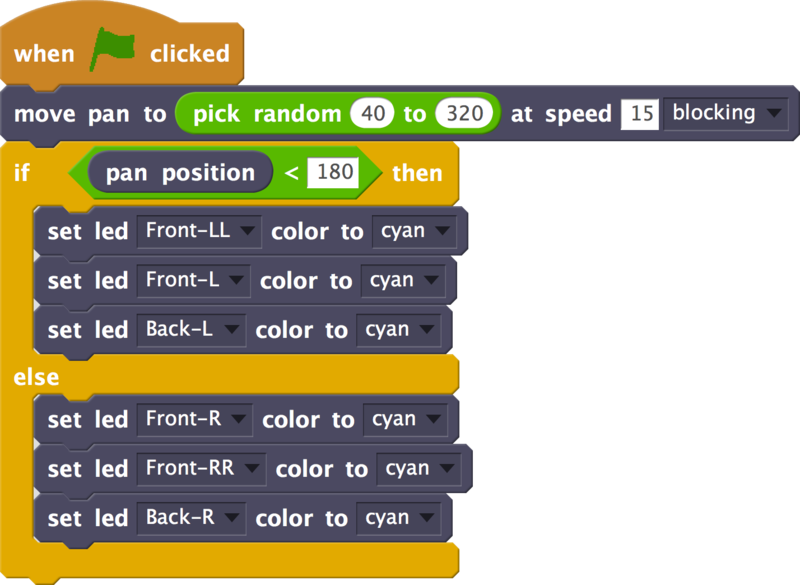 range: from 26 to 109, according to the values allowed for this engine, 90 being the start value (as shown in the image). Values less than 90 indicate that the smartphone holder is rotated backward, while values greater than 90 indicate that it is forward.